Growth of the nurse call systems market is gaining traction due to substantial growth in health care expenses, increasing the popularity of medical insurance mainly in the developing economies such as India and China, technological headways, and product upgradation. In addition, numerous government is imposing strict regulation on the usage of nurse call systems which are acting in the favor of growth of the nurse call systems market. These systems help in the consumer care and availability of the information for essential healthcare departments are some of the factors bolstering the growth of the global nurse call systems market. However, the high cost of implementation and lack of trained professionals of both the healthcare and IT are limiting growth of the global nurse call systems market. According to the report by TMR, the global market for nurse call systems is anticipated to expand at a CAGR of around 10.9% from 2017 to 2025 to attain a value of US$2,665.98 mn by the end of forecast period. 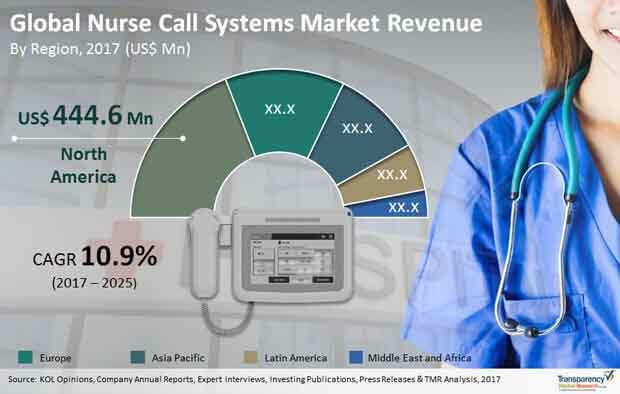 On the basis of equipment-type, the global nurse call systems market is segmented in to nurse call intercoms, basic audio/ visual nurse call systems, digital nurse call systems, IP-based nurse call systems, and nurse call mobile systems. Of these, IP-based nurse call systems dominated the global nurse call systems market in 2016 owing to the flexibility of installation such as installation in phases. On the basis of communication technology, the global nurse call systems market is segmented into wireless communication and wired communication. Of these, wired communication dominated in the market and expected to continue its dominance over the forecast period. This growth is attributable to the various government norms mandating for the wired infrastructure in acute care. On the basis of end-users, the market is segmented into hospitals, assisted living centers, nursing homes, and clinics. Of these, hospitals segment is dominating the global market and expected to continue its dominance over the forecast period. Thanks to higher adoption from hospitals than other segments. The patient-centric approach from the hospitals is fuelling growth of the global nurse call systems market. On the basis of region, the global nurse call systems market is segmented into North America, Europe, Asia Pacific, Latin America, and Rest of the World. Of these, in 2016, North America dominated the global nurse call systems market and expected to continue its dominance over the forecast period. This growth is attributable to the high elderly population in the region. However, Asia Pacific region is anticipated to grow with higher CAGR over the forecast period due to higher adoption of secure and wired nurse call solutions in nursing facilities for acute care. Additionally, improving healthcare infrastructure and improved access, flexibility, and mobility of the wireless communications are expected to fuel growth of the nurse call systems market presence in Asia Pacific. Key players operating in the nurse call systems market include Azure Healthcare Ltd., Cornell Communications, Hill-Rom Holdings, Inc., Ascom Holding AG, and TekTone Sound & Signal Mfg., Inc. The majority of the leading players are relying on the recent innovations in order to stand different from other competitors. These companies are increasingly taking part in the activities such as partnership, collaborations, and mergers for business expansion and improving product portfolio.